Jim Kenney is a graduate of Boston College and the content provider for the Option Professor. He has well over 25 years experience teaching people how the option markets work. To date, he has conducted hundreds of informative option seminars for thousands of people world-wide. 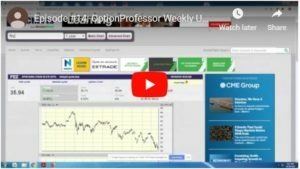 Each week Jim breaks down the markets and shares his knowledge and opinions, not only of current events but also his views on the direction of Stocks, Bonds, Gold, and the Dollar. Enter your information below to receive FREE instant access to each new Weekly Market Update with Jim Kenney. Enter your info below to get instant access to the most recent episode! There is always a risk of loss when trading. Past performance is not indicative of future results. Use risk capital only.